A Track is a place where you can drag a Region from your Region List and where you can record sounds coming from an outside source. A Region represents an audio clip, i.e., one of your sound files or just a portion of a sound file. In the image below, the area marked "Audio 1" is a Track, and the audio information inside that Track is a Region. A Bus is similar to a track except that it does not contain its own regions. You cannot record directly into a bus or drag regions into it. In the image above, the area marked "master" is a Bus. Usually every session has a Master Bus. All the audio to be Exported from your Session will be sent to the Master Bus. How are Tracks and Busses Used? Audio-processing Plugins and Automation can be applied to both Tracks and Busses. Audio tracks can be routed to Busses. In fact, many Tracks can be simultaneously routed to one Bus. Busses are traditionally used as a convenient way to apply any kind of signal processing to many Tracks at once. For instance, you might find it useful to route all Tracks that contain drum sounds to a single Bus that you would call 'drum bus'. Then, if you decide that all your drum Tracks are too loud, you can quickly adjust the level of the 'drum bus' rather than adjusting each separate Track that feeds into it. Another use of a Bus would be to have a common Reverberation Plugin, so that any audio Track which requires the Reverb effect could be routed to a single Bus. 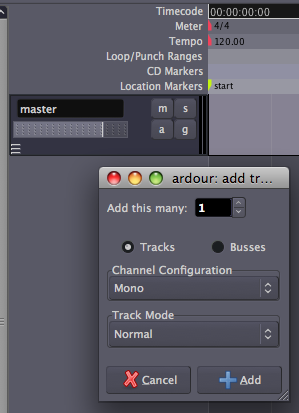 Add this many lets you specify how many Tracks (or Busses) you would to like to create. Choose Tracks or Busses to specify whether you want to create Tracks or Busses. The Channel Configuration drop-down menu allows you to specify how many channels of audio you'd like the new Track or Bus to handle. The choice made here will affect which Plugins you can use on the track (Mono tracks cannot use Stereo Plugins and vice versa), as well as the kind of audio files which can be Imported to the Track. The last menu, Track Mode, gives you a choice between Normal Mode and Tape Mode. Normal Mode creates a new Region for each Recording Take, and is suggested for beginners. Tape Mode destructively records--in other words the previous Take of a Track is eliminated with each new Take. Finally, click the Add button to create the Tracks or Busses you have just configured. You will see them appear as new rows in the Main Canvas. Once you've added one or more Tracks, you will want to put some audio material into them to work with. Continue on to the Importing Audio and Recording Audio chapters to learn how to do this.